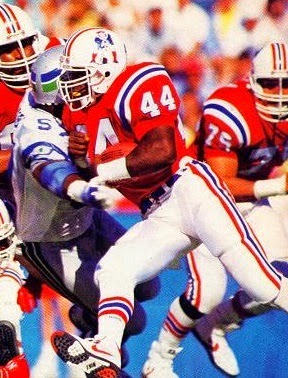 After setting a school rushing record with 3057 yards at Northwestern State, Stephens was chosen by the Patriots in the first round (17th overall) of the 1988 NFL draft. He proved to be a key component in turning the team around from a 2-4 start with his solid running between the tackles. Patriots went 9-7 to finish third in the AFC East. Beginning in the preseason, Stephens was dogged by injuries in 1989 and his production slipped to 833 rushing yards with an average of 3.4 yards per carry. It was a similar situation in ’90, gaining 808 yards on the ground with a 3.8-yard average gain. While an effective power runner who rarely fumbled, his tendency to carry the ball with both arms slowed him down. Relegated to a backup role behind rookie Leonard Russell in 1991, Stephens was shifted to fullback in ’92. He was traded to Green Bay in 1993 but lasted five games before finishing up with the Chiefs in what was his last pro season. Overall, he rushed for 3440 yards on 945 carries (3.6 avg.) and gained another 812 yards on 105 pass receptions, scoring a total of 20 touchdowns.